← Is Search Engine Ranking necessary for a Small Business? Today, whilst trying to get on top of the gardening, I spotted a pair of Swallows arrived fresh from their African winter holiday. When I pointed them to my wife, she said “Oh they’ve escaped from Libya” . The rest of the afternoon was spent planting Asparagus, our new permanent crop which we successfully grew in the UK, and early potatoes. A variety, I am assured by Jean-Luc at the local garden centre in Villedieu, is planted in Brittany on the 14th February, and is hardy enough to take a frosting. If they do get frosted, I will follow last year’s tip that worked and spray the frosted leaves with cold water. The grass is growing, which means summer lawn mowing season has started, on the bits where the four-legged lawn mowers aren’t allowed. It was good to see the lambs outside enjoying the spring grass with their mother. Hopefully some more will be joining them soon, which will means a freezer full of tasty meat next winter. Maybe soon there will be a real spring in Libya and its people won’t have to become refugees to taste democracy. Still I am glad to see the swallows back in Normandy which means winter is finally over and summer is on its way. Update: Spotted three White Storks flying north probably heading for Cotentin-Bessin Nature Reserve. Other species this area is home to include: Whinchat, Meadow Pipit, Skylark, Reed Bunting, Sedge Warbler, Lapwing, Curlew, Bittern, Spotted Crake, Montagu’s Harrier, Marsh Harrier, Bluethroat and Kentish Plover. I am an internet programmer, and smallholder. I am really trying to figure out what I can do with Wordpress. A few observations and thoughts which someone on the dark side of the moon might find either useful or interesting. 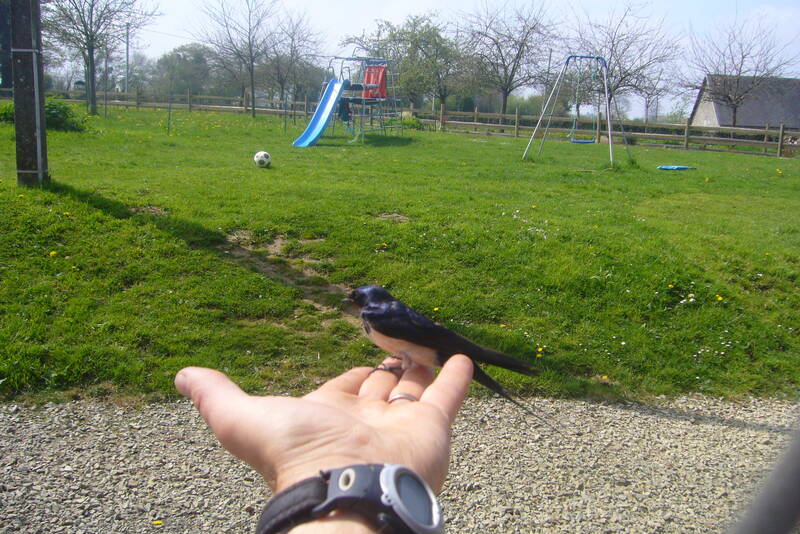 This entry was posted in Ideal World, Normandy, Smallholding and tagged Libya, Refugee, Smallholding, Spring, Swallow. Bookmark the permalink.